DanaArtGallery, impreuna cu Metropolis Center, organizeaza deschiderea oficiala a spatiului dedicat promovarii artei plastice contemporane, sub numele Metropolis Art Collection. DanaArtGallery este o galerie de arta contemporana care de 4 ani promoveaza peste 40 de artisti contemporani romani prin organizarea de evenimente culturale in Romania si peste hotare. Cu acesta ocazie va invitam sa vizitati expozitia Metropolis Art Opening, unde veti putea admira cele mai recente lucrari semnate de artistele Adriana Vasile, Bogdana Contraș, Cornelia Gherlan si Daniela Zbarcea. Expozitia aduce in prim plan varietatea expresiei plastice in arta contemporana si ancorarea in realitatea artistica la nivel global a artistilor. Ceea ce ne incita vizual la picturile celor patru artiste este spontaneitatea cu care sunt lucrate picturile , dar si expresia plastica originala cu care abordeaza tematicile alese. Vernisajul are loc pe 21 mai 2014, la ora 19:00. Metropolis Center - Str. Grigore Alexandrescu nr. 89-97, Bucuresti. DanaArtGallery, together with Metropolis Center, organizes the official opening of the space dedicated to promoting contemporary plastic art, under the name of Metropolis Art Collection. DanaArtGallery is a contemporary art gallery that has been promoting over 40 contemporary Romanian artist, for four years, by organizing cultural events in Romania and overseas. 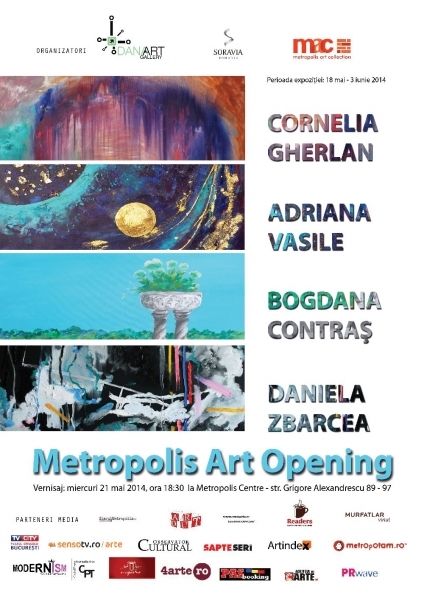 With this occasion, we invite you to visit the exhibition Metropolis Art Opening, where you'll be able to admire the most recent works signed by artists Adriana Vasile, Bogdana Contrș, Cornelia Gherlan and Daniela Zbarcea. The exhibition brings to the front the variety of plastic expression in contemporary art and the anchoring in the artistic reality at a global level of the artists. That which incites us visually at the paintings of the four artists is the spontaneity with which the works are made, but also the original plastic expression with which they address the selected topics. The exhibition can be visited between May 18 - June 3 2014. The opening will be on May 21, 2014 at 7 P.M. Metropolis Center - Str. Grigore Alexandrescu nr. 89-97, Bucharest.